The event takes place in the Yawkey Conference Center which is on the 3rd floor of the Yawkey Building at Dana-Farber Cancer Institute. The elevators from the lobby of the Yawkey Building, as well as the parking garage, open around the corner from the conference center. 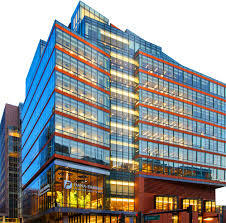 Maps, directions, and parking information can be found on the Dana-Farber Cancer Institute website. Parking is available at Dana-Farber Cancer Institute. It is recommended to carpool with colleagues if possible as parking in the garage is fairly limited. Visitor parking for the Fall Meeting is available on Level P3 and lower (P1 and P2 are valet only). Those who park in the garage will be provided with guest parking stickers by the lot attendant. Parking for the event is free of charge on site at the Dana-Farber Cancer Institute garage. Various transportation options are available from the Boston Logan International Airport. Dana-Farber Cancer Institute is only seven miles from the airport. If you have pre-registered, your name badge and program book will be waiting for you at the registration desk located in the lobby. The conference registration desk will be open at 7:00 a.m.
Those with dietary restrictions will find Restricted Diet meal tickets placed in their name badges. While meals will be served buffet style, these meal tickets may be shared with dining hall staff as necessary for breakfast and lunch if special accommodations are needed. Light snacks and beverages will be available during the morning and afternoon breaks. After the meeting has ended, all registrants will be sent an email with a link to complete an online form in order to obtain a CE certificate. These will be electronic certificates which may be printed or saved. AAOM values your feedback. Please take the time to complete our evaluation survey once the meeting has ended. If you have not pre-registered for the meeting, please register at the registration desk upon arrival. Please be prepared with check or credit card; no cash payments for registration can be accepted, thank you for your understanding. In case of unforeseen circumstances, it's important to let us know if you can no longer come to the meeting. All cancellations are permitted and must be submitted via email. Please contact the AAOM Office right away to provide written notice of your cancellation or substitution.